Thanks to the coverage on The Rachel Maddow Show of a fundraiser held for Governor Romney on the very day that former Secretary of State Colin Powell endorsed the campaign of President Obama, this post doesn't need to be written. 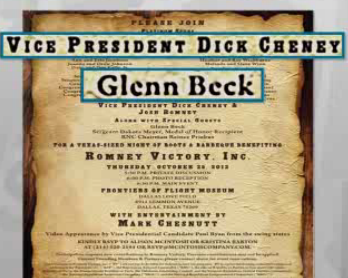 Maddow covers virtually everything that needs to be said about Glenn Beck, who Mitt Romney introduced in 2009 as a "stateman," hosting a fundraiser at this stage in the campaign. When Gov. Romney is turning from his extremist policy positions that helped him win the primaries, with 12 days to go to impress upon moderate, independent voters how moderate and reasonable Romney is, he turns to Glenn Beck to help him raise money. Really? Romney is associating with extremist Beck at this point in the campaign? Via MSNBC, liberal Rachel Maddow explains the significance of this "gala." The only point worth adding is that Beck himself did not consider this fundraiser important enough to mention in his newsletter the day of -- or the day after -- this event in TX. One has to wonder why not? Even more strange, one has to wonder how Romney could need money at this point enough to be reported associating with Glenn Beck.